This stylish mens multifunctional FOCUS watch by HUGO, features a gold IP stainless steel bracelet and 42mm gold IP stainless steel case with ice gold sunray dial. The dial is complete with day, date and hour function, and signature logo at 3. It is water resistant to 30m and comes with a 2 year international warranty. 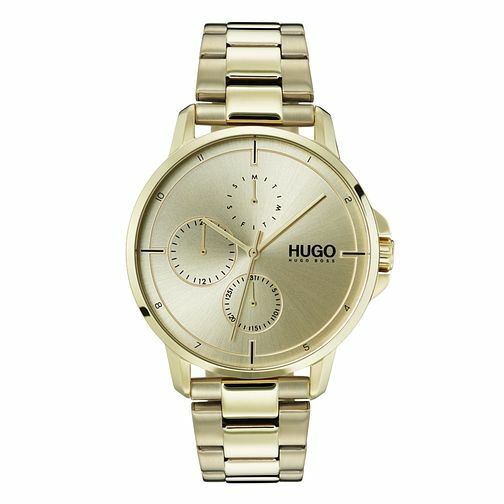 Hugo Gold Plated Gold Dial Bracelet Watch is rated 4.0 out of 5 by 2. Rated 4 out of 5 by Anonymous from Great quality. Loved this watch good quality and looks great. Delivery was a little slow but it was Christmas.